If you still haven’t found your perfect dress, Vanila Wedding Boutique could be about to make your wedding dress dreams come true, as they’re taking away all of the stress of the hunt, by exclusively bringing the new St Patrick 2017 Collection directly to you. 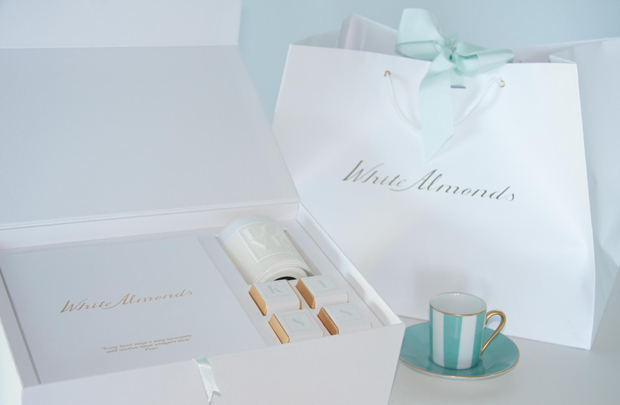 For the very first time in the Middle East, Dubai’s fabulous award winning Vanila Wedding Boutique will be hosting the Real Trunk show experience right here on our doorstep. From October 21st – 29th, lucky UAE brides-to-be will have a unique chance to see and try on up to 30 different styles of the upcoming collection. But what’s even better, each of the 30 will have been carefully selected by the St. Patrick team to suit each bride-to-be and her needs. When you’ve fallen in love with a dress from the new collection (we’re pretty sure you will!) you’ll get the chance to be one of the first in the region to not only place an order from the 2017 collection, but to also receive one of the dreamy dresses – tailored to fit you perfectly. 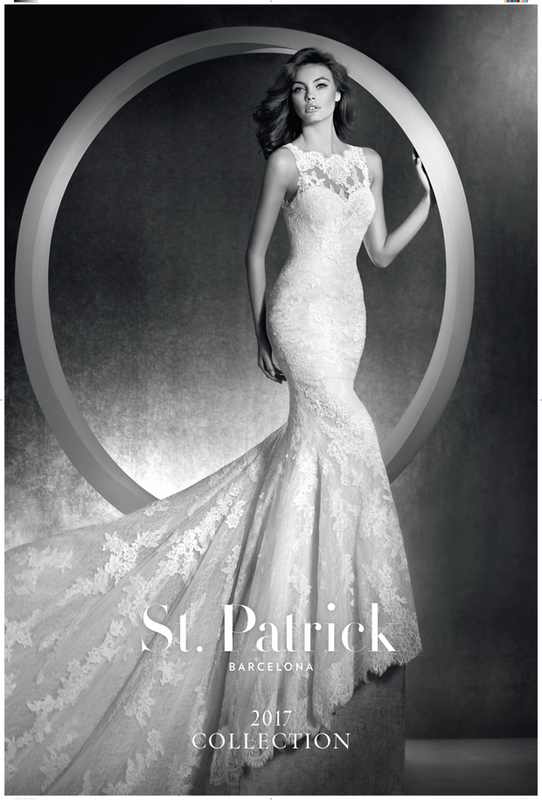 The new St. Patrick collection once again offers dreamy dresses that bring extra magic for the bride on that special day. With a variety of stunning silhouettes and great attention to detail in all of the finishes, every bride is guaranteed to find her dream dress. From classic princess or mermaid cuts, to the empire waist or reinterpreted trumpet cuts, the new collection is rounded off by the introduction of short dresses, a new option inspired by cocktail dresses of the ‘50s. All of the pieces have eye-catching details and accessories integrated into them, adding an extra glimmer of light to the shoulders, waist, back or neckline. 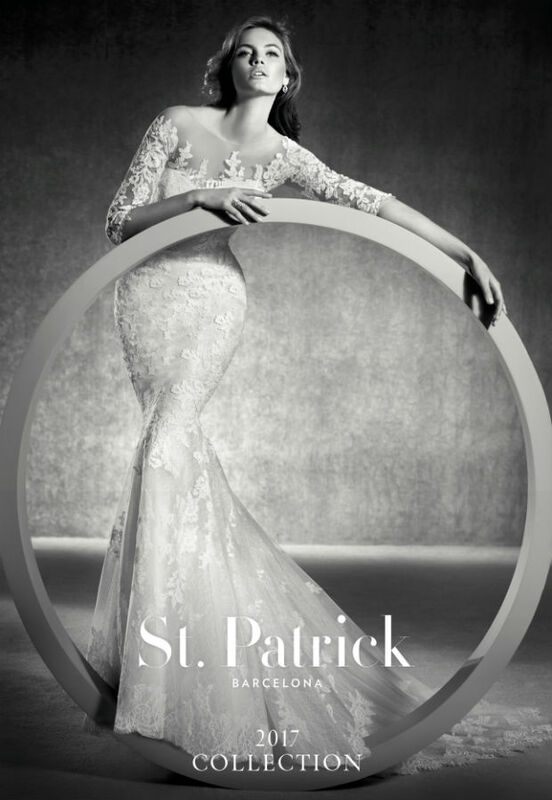 St Patrick’s 2017 Collection has a great range of fabrics, meaning every bride will be unique on her most magical day and be the picture of romance. Think flowing crêpe, ethereal and translucent gauze, tulle and lace and you’ll have an idea of this awaited new collection. The designs have evolved to become lighter than the previous season’s, thanks to a very pure, flowing silhouette, moulded by a well-studied harmony of the materials and the pattern design. Keeping the designs fresh, there’s a subtle application of lace with transparencies on the sides, which elegantly outline the silhouette of some designs, while gemstones and jewelled backs still feature strongly to add some extra sparkle. While white still plays the leading role, the new collection is revitalised by the introduction of pastel colours, including pink, vanilla or blue, giving a different twist to the traditional bridal gown and giving you the perfect option if you’re after something a little bit different. Prices range from AED 8,000 – 12,000, but any order placed between October 21st – 29th will receive a 15% discount on the price of the dress, plus an additional 15% discount on any veil from the boutique. 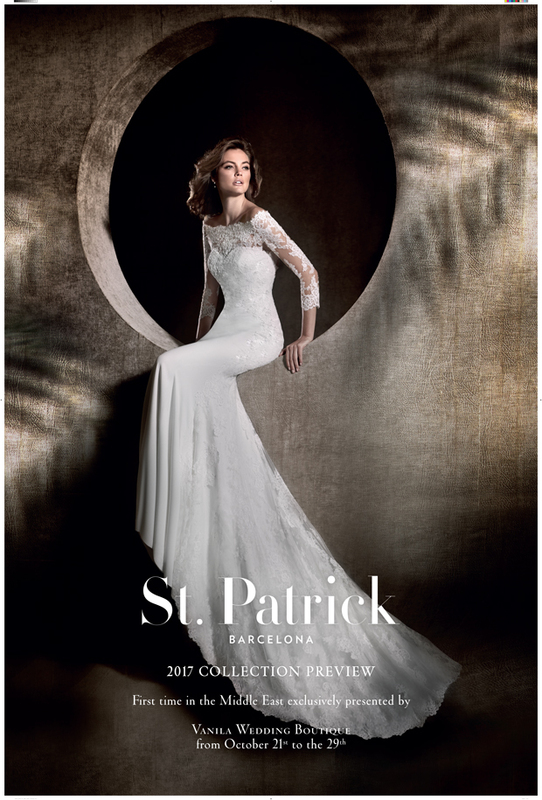 Pre-booking is compulsory, so for your chance to preview St Patrick’s beautiful 2017 collection, head to Vanila Wedding Boutique now to secure your appointment!